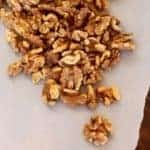 Chai Walnuts combine all the flavors you love from the drink into a snack, breakfast or appetizer. What’s not to love about such a versatile recipe? In a large mixing bowl stir together oil, brown sugar, and spices. Add walnuts. Stir to coat. Spread in single layer on baking sheet. Bake 10 minutes, stir. Bake 10 minutes more, until nuts are toasted.